In this month’s update we wanted to show you how we’ve been changing the the way we work to increase the rate at which new Wild Apricot features are released. See our Release Notes to learn more about these features. And, since 2006, we've published 64 major releases, offering hundreds of new requested features. Moving forward, we are really focusing on ramping up the rate at which we release new features. The future looks promising, as we’ve changed the way our development team interact with each other. You’ll be interested to know that over 40% of our annual revenue is directly invested into Research and Development. Our software development team consists of over 60 developers, quality assurance specialists, designers and system operations engineers (that’s roughly 75% of our total workforce!). In our July update, we mentioned that we had taken a huge leap forward in how we collect your feedback, by migrating our Software Forums to the Uservoice platform. Uservoice has transformed the way we collect your feedback, as users can now vote on ideas and see the status of upcoming releases. We have over 550 active contributors who have cast almost 2000 votes for different requested features, and we’re looking forward to hearing from more of you! Visit our Wishlist forum to learn more. Have you noticed how Google Chrome has multiple updates a week? That’s our long-term goal. In order to further ramp-up the rate at which we release features, we are reshuffling the way our teams work together. Our teams and their responsibilities will be staying the same, but the way they work together has changed. We’ve implemented a new group-based development approach that will see members from each team (product design, development, quality assurance and system operations) work together on a feature from its inception to release. This will allow each person in the group to bring their expertise to the table and have their input taken into consideration from the very beginning. This is an increasingly popular model for development teams to work together to produce software, and we’re confident that this approach will help us release better features, more often. Each year Capterra (a free resource that helps people find and compare business software) conducts a review to determine the top 20 membership management software options and publishes these in an infographic: Top Membership Management Software. 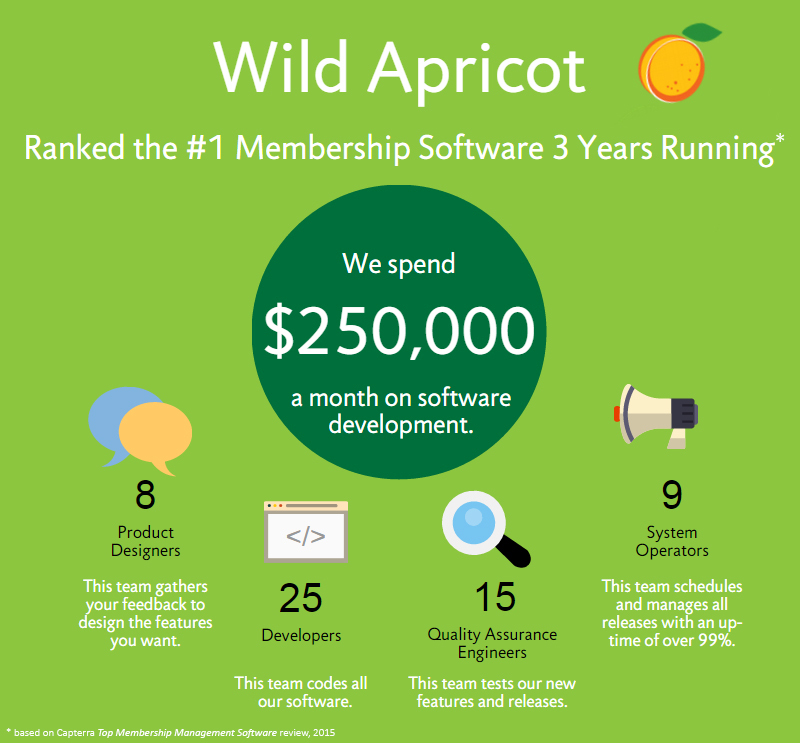 The investment into our people and our software has seen Wild Apricot to once again rank #1 among Capterra’s Top Membership Management Software - that's 3 years in a row! Software is and always will be the core of our business, and moving forward, we will continue to invest large portions of our annual revenue into research and development to continually update and improve Wild Apricot. We will also continue to invest heavily in technology infrastructure to help make sure you have fast, reliable access to your Wild Apricot account at all times - our monthly bill for hosting infrastructure is now over $40,000. Multi-session events: With Version 5.6, users will be able to set up an event consisting of multiple sessions occurring on different days. This means you’ll be able to schedule multiple sessions for one main event, and your attendees will have to sign up only once! This perfect for organizations that hold courses, workshops or lecture series that have more than one meeting date. Keep track of what we're working on right now by viewing our Product Roadmap. We keep this page up-to-date so that you can expect when our new features will be released. And right after version 5.6 in September, we will update our mobile applications (both iOS and Android) - they will become much faster. For example, event attendees search will be almost instant so we hope that more and more admins will start using our mobile app for attendees checkins at the spot.